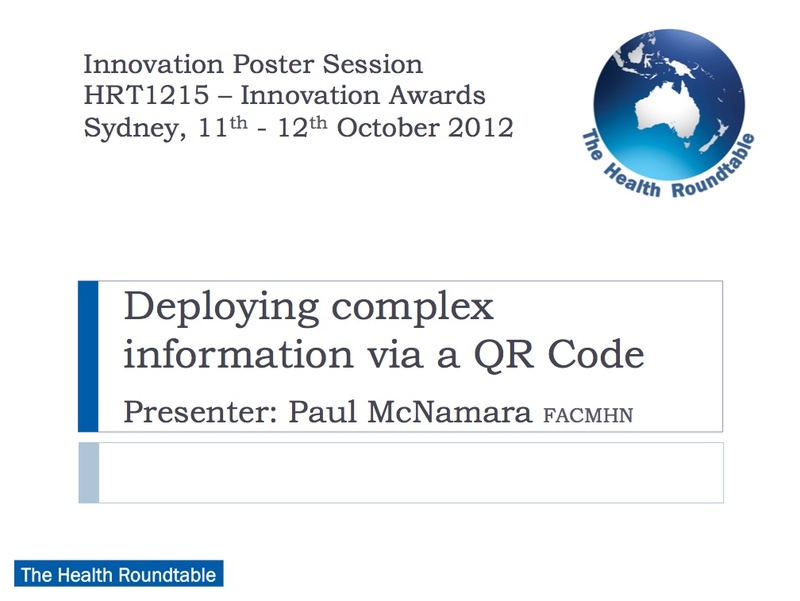 The Health Roundtable hosted the Innovation Workshop and Awards in Sydney on 11th and 12th October 2012. David Dean, General Manager of The Health Roundtable, endorsed the views of Futurist Tim Longhurst who said, in his lively and entertaining opening Keynote, “It’s not enough to say it anymore. It’s not enough to publish it anymore. Post it. Get it online. Sharing is the rent you pay for using the internet.” It is with those words echoing in my ears that I have posted a YouTube version of my poster presentation (it’s my first time at this – I’m not all that happy with the visual quality of the video, but want to get it online sooner rather than later). There were 16 concurrent sessions grouped into 4 streams at the conference. In each session participants were asked to vote for the poster presentation which provided the most useful ideas for implementation at their service. At the end of the conference a summary of all session winners was presentated, and participants were again asked to vote on the idea their health service would be most likely to utilise – this yielded four awards: one for each of the four conference streams. That’s me on the left, grinning like a Cheshire Cat. Presenting the Health Roundtable 2012 innovation Awards is Dr Nigel Lyons, Chief Executive of The Agency for Clinical Innovation. 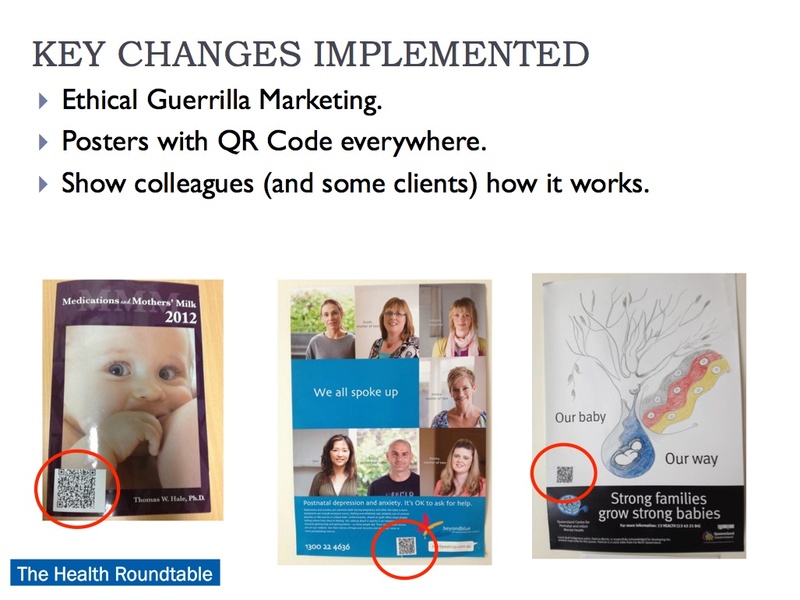 My presentation, “Deploying complex information via a QR Code” won the 2012 Innovation Award in the “Improving Quality of Patient Care” stream of the Health Roundtable’s Innovation Workshops and Awards. 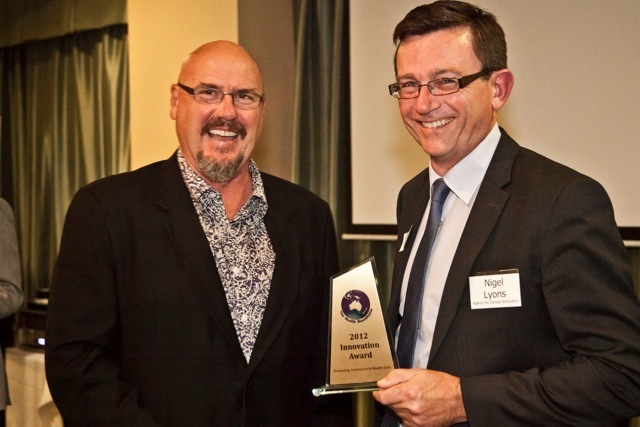 Naturally, I am thrilled with the award – it carries prestige and is worth $6000 to the health service that employs me. 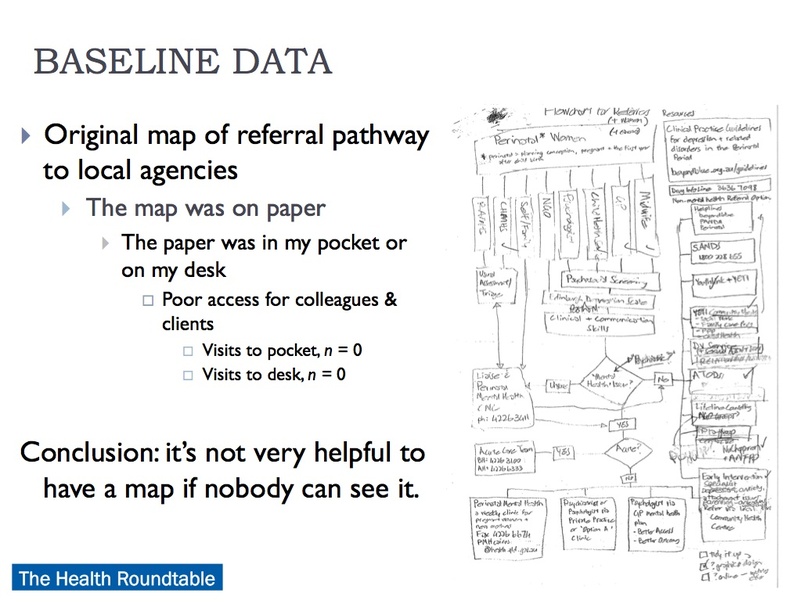 It is also quite humbling because this certainly wasn’t the “best” idea in terms of sophistication, complexity or outcome – many of the other ideas presented have made more significant acheivements in regards to the quality of patient care, in my view. 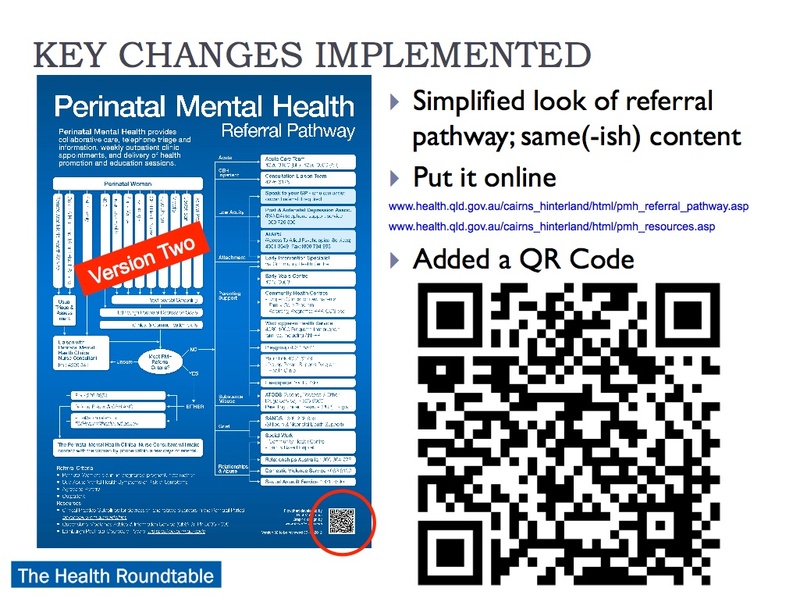 However, the feedback was that the no-cost/low-cost nature of using QR Codes, the simplicity of implementation, and the ability to apply them to a number of different uses in a number of different settings, made this an idea that could easily be adopted and adapted by many health services. 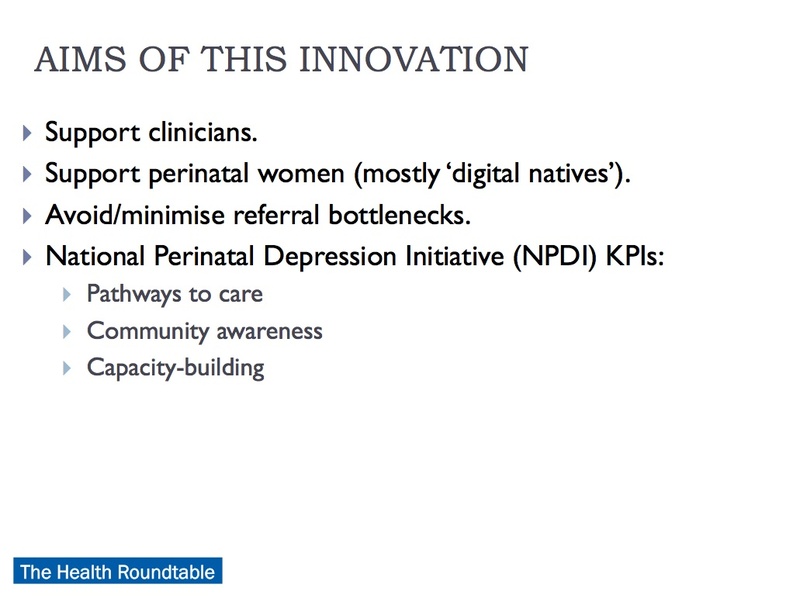 This reflects the stated objective of the Innovation Workshop and Awards: “Shamelessly steal at least one good idea to take back to your health service and use”. 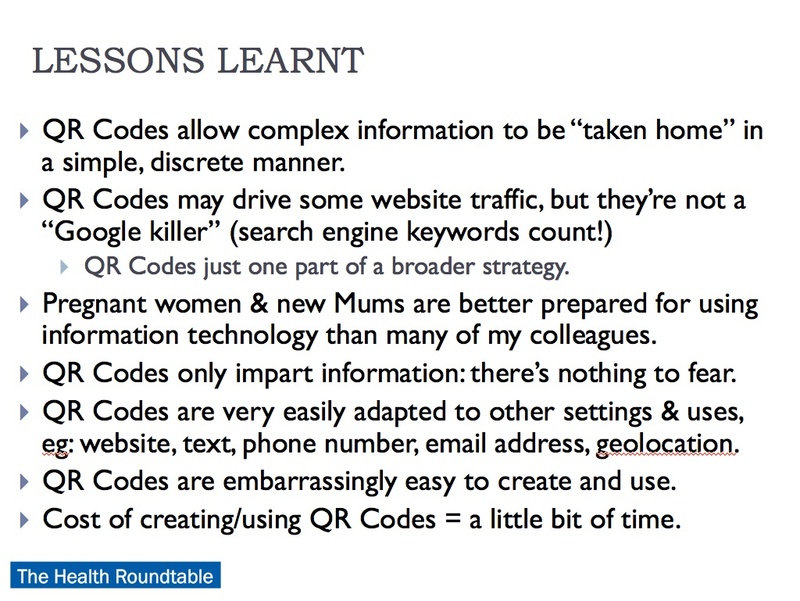 Let’s not overstate the utility of QR Codes – they won’t be an effective tool for every demographic group, and certainly won’t replace the written word/existing methods of communication. However, with a little bit of imagination, you might be able to find an application for QR Codes that will enhance your workflow/workplace. Have a look at the YouTube video above if you’re still unsure what this is all about. Joe Petrucci and Kevin Freele of the Cairns & Hinterland Mental Health Service for introducing me to The Health Roundtable earlier this year. Marion Dixon and Pieter Walker, who are both with The Health Roundtable team, gave very strong encouragement to bring the idea to Sydney. I certainly would not have had the confidence to present the idea to my peers without their encouragement, so hope that Pieter and Marion feel very much a part of the success of the presentation and the 2012 Innovation Award. 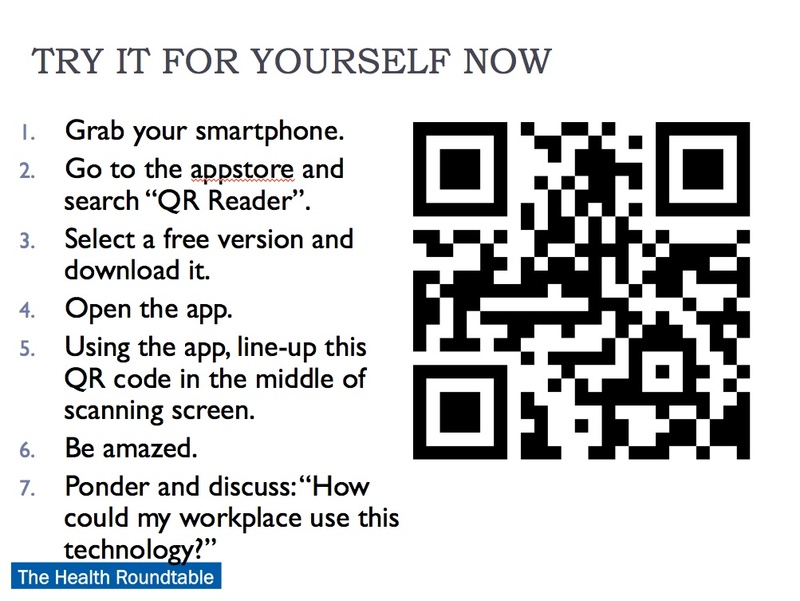 Go to the appstore and search “QR Reader”. Select a free version and download it. 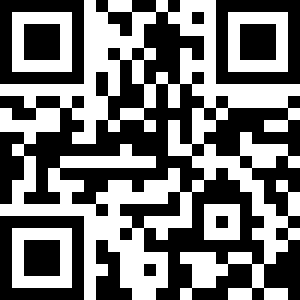 Using the app, line-up this QR code in the middle of scanning screen. Below are JPEG images of the individual slides (click to enlarge). 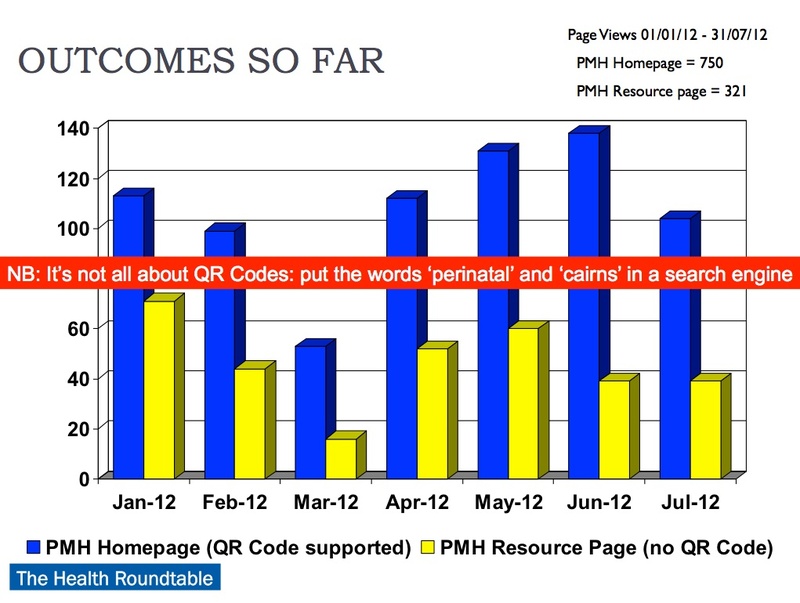 This entry was posted in Blog and tagged award, geeky stuff, Health Roundtable, innovation, Perinatal Mental Health, QR Code on 13 October 2012 by Paul McNamara.